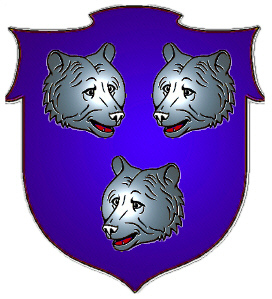 Coat of Arms: A blue shield with three silver bears' heads. Spelling variations include: Forbes, Forbose, Forbess, Forbeis (Gaelic), Forbush, Forbish, and others. The name is from the Gaelic term "forb-ais" means "at the land". Originally the name w as pronounced as two syllables sounding like "For bays" but that is largely lost. Established in Aberdeenshire on the banks of the river Don, they had been there long before being raised to a barony in 1271 by Alexander III. Duncan de Forboys paid homage in 1296 to John Balliol and John Forbes signed the "Ragman Roll" in 1296. 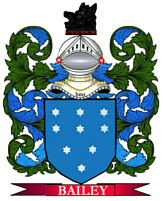 Forbush Coat of Arms: [same as Forbes] a blue shield with three silver bears' heads. Forbush Crest: A stag's head. Forbush Motto: Grace me guide. The name [Forbes] is from the Gaelic term "forb-ais" means "at the land". Originally the name was pronounced as two syllables sounding like "For bays" but that is largely lost. Established in Aberdeenshire on the banks of the river Don, they had ben there long before being raised to a barony in 1271 by Alexander III. Duncan de Forboys paid homage in 1296 to John Balliol and John Forbes signed the "Ragman Roll" in 1296. The main lines of Forbes were established in the 14th century. Sir John de Forbes of the Black Lip, justiciary in Aberdeenshire, had four sons - William the first of the Pitsligo line, John the ancestor of the Forbes of Polquhoun, Alistair of Brux who established the lines of Skellatar and Inverernan. Sir John's eldest son fought beside the Earl of Mar at the Battle of Harlaw in 1411 against Donald, Lord of the Isles and became Lord Forbes around 1445. Forbes eventually became the premier lordship of Scotland. James, 2nd Lord Forbes had three sons, the two younger offspring establishing the Forbes of Corsindale and Monymusk and of Craigievar. The Forbes expanded their territory, at one time covering half of the earldom of Mar. However, over the years, there were feuds with the powerful Gordon clan and the Leslies, culminating in two battles and several massacres. Two Acts of the Scottish Parliament were required to force the factions to lay down their arms. King James VI confirmed the Forbes in their lands in 1582 but the cost of the struggles with the Gordons had created debts and much of the Forbes land had to be sold. Robert Forbes, the episcopalian bishop of Ross and Caithness was arrested for being a Jacobite in 1745 but survived to write a three volume account of the Jacobite Uprising, entitled "The Lyon in Mourning." Involvement of the Forbes in the 1745 Uprising resulted in forfeiture of lands and title. The first Baronet of Craigievar, Sir William, built the outstanding Craigievar Castle in 1626 and it is now in the care of the National Trust for Scotland. Craigievar is said to be haunted by a member of the Gordon family who was murdered in the castle. Another of the Forbes, the Baron of Monymusk, now lives in New Zealand. In 1815, the 17th Lord Forbes built Castle Forbes near Alford which is still the home of his descendants. The Forbes clan motto is "Grace me guide." Surnames regarded as septs (sub-branch) of the Forbes clan include Berry, Boyes, Michie, Walters. Forbes was the 93rd most frequent surname at the General Register Office in 1995. There are Forbes clan Web sites at here and here. First found in Aberdeenshire where they were seated from very ancient times, some say well before the Norman Conquest and the arrival of Duke William at Hastings in 1066 A.D. Some of the first settlers of this name or some of its variants were: Alexander Forbes (c. 1755-1848) who after serving in the 38th Regiment, settled in Shelburne N.S. and was granted land; Alexander Forbes (c. 1793-1830) who served in the North Carolina Highlanders and later settled in Kingston, Ontario. FORBES (British). Possibly a modern form of the ancient Irish name "MacFirbis". FORBES (British). "Field, district" (Scots Gaelic), place in Scotland.